Vaughan’s new film, Blood and Dust, is below for those who didn’t catch it on Al Jazeera’s People and Power strand. If you want to see it on a large screen we will showing it at the Frontline Clubon 6 March. Followed by a discussion about how war is represented by the broadcast media. I have done a fair number of military embeds in Afghanistan over the last few years but was concerned that I hadn’t filmed the suffering of war, just its machinery. 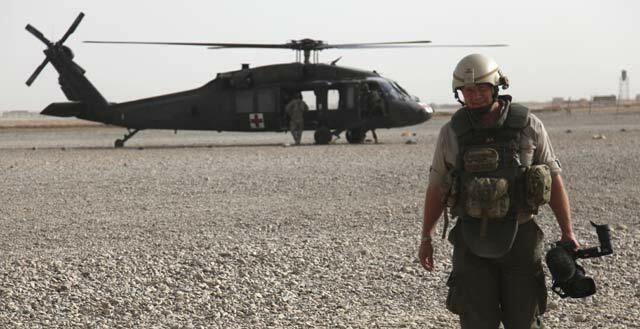 This being a grevious ommission I went back last winter to film US army air ambulances, ‘Dustoff’ helicopters, flying over Marjah in Southern Afghanistan. The pictures are strong and show both US marines and Afghan civilians being lifted off the battlefield in equal numbers. I have been pretty busy since returning from this trip last year, what with Julian Assange coming to stay and all that that means. It is very much thanks to the Al Jazeera documentary chaps, John Owen, Diarmuid Jeffreys, Neil Cairns and last but certainly not least because he did the video editing, Ross Birkbeck, that I got it out at all. I have worked with Al Jazeera on this because I couldn’t find another news broadcaster in Britain that would show the film without cutting out the stronger images. I have huge respect for the way Al Jazeera as a broadcaster engages the world while many others appear to retreat from it.